I read a lot of food blogs. I’m always looking for fabulous recipes that are quick and simple. This winter, I saw the most adorable melted snowman cookies on several blogs, however, they were all the make it from scratch type blogs. I’m more of a semi-homemade girl myself. So, I simplified the “recipe” and made the cookies to take to a playdate. My simplified version of this cookie starts with a Betty Crocker Sugar Cookie Mix. Bake the cookies as you normally would following the directions on the package. Then, I covered them in white Betty Crocker Cookie Icing - which by the way is the best tasting on the market cookie icing I’ve tried yet. Take your regular sized marshmallows and put them on a plate in the microwave for about 15-20 seconds. Watch them carefully and do NOT let them puff up. This will give them that sort of melted look as the marshmallows ever so slightly cave in. Watch your fingers as you remove these little suckers because they are hot - but then go ahead and dab a little bit of the cookie icing onto the Marshmallowand place it in the center top of the cookie. Now let them dry for a bit - say a half hour or so. The Betty Crocker Cookie Icing dries pretty quickly. 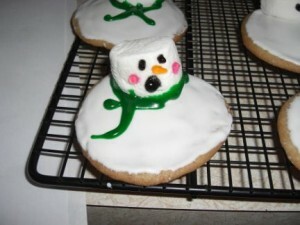 Then decorate as you wish using cookie or cake gel icing. My scarves were done with Wilton Cookie Icing. The rest of the decorating was done with those small cake gel tubes that you can find in the baking aisle of the grocery store. Below is a pic of some of the decoration variations I used. I really like the ones with the scarves versus no scarves. And my favorite is the one up front with the “Oh No” look on his face. These were simple and easy to make and were a HUGE hit at the playdate. These will definitely be added to my annual holiday cookie recipe file and may even be my next cookie swap cookie! 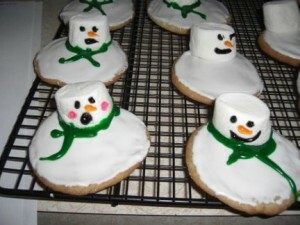 Melted Snowman Cookies has been posted in Crafty Mamamamahoney and Tagged: betty crocker cookie icing, betty crocker sugar cookie mix, cookie swap cookies, cookies that start with a mix, easy cookies, holiday cookies, Melted snowman cookies, mix cookies, snowman cookies.